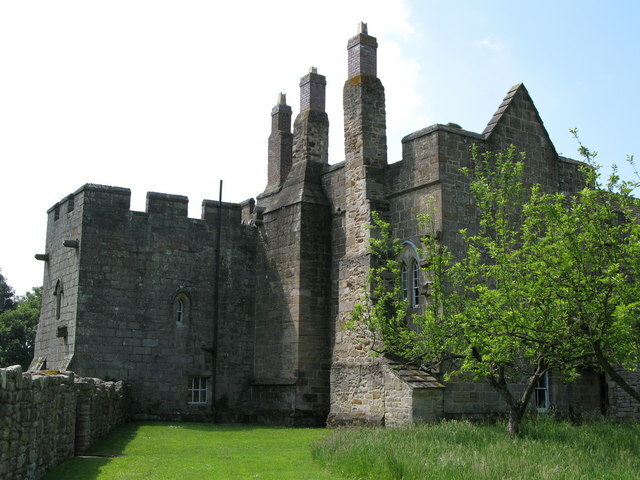 Notes: Aydon Castle, previously sometimes called Aydon Hall, is a fortified manor house at Aydon near to the town of Corbridge, Northumberland, England. It is a Scheduled Ancient Monument, and is designated by English Heritage as a Grade I listed building. Documentary evidence shows that a timber hall first existed on this site. The manor house was built by Robert de Reymes, a wealthy Suffolk merchant, starting in 1296, adjacent to the steep valley of the Cor Burn. At this time the building consisted of a two storeyed hall house with a solar, dining hall and kitchen on the upper floor. In 1305 he obtained a licence to crenellate his property and added battlements and curtain walls. It was captured by the Scots in 1315 and again in 1346. In the middle of the 16th century it was renovated and in the middle of the 17th century it was converted into a farm. The building remained in use as a farm until 1966 but has since been restored to its medieval appearance. It is managed by English Heritage. "Aydon Castle". CastleUK. Archived from the original on 3 January 2008. Retrieved 2007-12-03. "Aydon Castle". North of the Tyne. Archived from the original on 10 January 2008. Retrieved 2007-12-03.